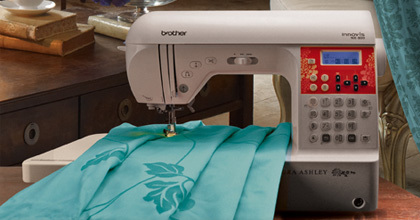 The new Laura Ashley® Limited Edition Brother Innov-ís NX-800 sewing machine, which offers outstanding performance in both sewing and quilting, is the second Laura Ashley licensed machine from Brother. The Laura Ashley Limited Edition Innov-ís NX-800 showcases the latest in technological advancements with almost endless stitch possibilities to accommodate large home décor projects, elaborate garment construction, quilting and typical everyday sewing tasks. User-friendly features include: an easy to use-automatic threading system, 10 buttonhole styles, a Quick-Set™ bobbin, enhanced fabric feed and an LCD display screen. The machine has 138 built-in sewing stitches and three sewing fonts. Sideways sewing can be used with either straight or zigzag stitches, perfect for sewing patches and appliqués. The My Custom Stitch™ feature is also included and is used to combine and alter pre-set stitches. Plus, 10 memory pockets let users store created stitches for later use. Today's sewing and quilting enthusiasts will love putting "a touch of English in every stitch" with this Laura Ashley inspired sewing machine.